To subscribe to all parks newsletters and updates, add your contact details. Please note, the Parks Team update will be circulated on a quarterly basis. You may receive monthly or bi-monthly for parks related news and updates. tfofwg@gmail.com @FredWellsGardens Facebook.com/Friends of the Fred Wells Gardens If you would like to feature in the newsletter, email gkelly@wandsworth.gov.uk with your updates! 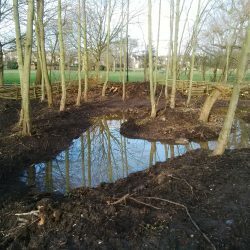 During February Enable Parks, Quadron and Froglife created shallow wetlands at the northern end of the main lake on Wandsworth Common. These wetlands are intended for breeding frogs, toads and newts. They will fill naturally with rainwater and lake overspills and dry out seasonally in summer and autumn once the amphibians have finished the aspects their life cycle that require water. Trees were coppiced to allow light into the area and the wood has been stacked at the edges and covered with soil where it will provide habitat for the froglets, toadlets and newtlets throughout the remainder of their life cycle. The area is temporarily fenced off whilst the plant life re-establishes. Bramford Gardens The large shady bed next to the community garden planted in November is doing well and is starting to fill out. The Hellebores were in flower over the winter and the Leucothoe provided crimson hues too. The Acanthus mollis is doing particularly well. Montefiore Gardens The ‘L’ shaped bed planted in November with perennial bedding is doing well and should develop throughout the coming months and fill out with flowering plants. The bulbs that have remained along the fence line have looked good all spring providing lots of colour. 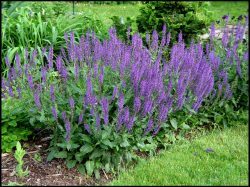 Look out for the perennials quickly sprouting into life in the next few weeks. Heathbrook Park The central island bed planted in March 2015 was a success over last summer but has suffered recently. Some damage to the shrubs and trees will mean that we will be replacing some of the shrubs to give it a chance to reach its potential. It should still look great this summer with lots of scented flowers. Keep an eye out for the long flowering Penstemons that still have flowers in the autumn. Fred Wells Gardens The areas planted in November 2015 are doing well and have added interest to an otherwise bare part of the park. Along with the recently installed railings the new planting greatly improves this area of Fred Wells Gardens and hopefully it will thrive in this well loved local park. Wandsworth Park The bed adjacent to the tennis court planted up in January will remain fenced off temporarily to give the plants a chance to establish. The bed was planted with a selection of Hebes, Fatsia, and Berberis to give varied texture and colour. Groundcover plants Vinca and Waldsteinia have been planted under the tree canopy to try and provide colour in this bare patch. Coronation Gardens Shrubs planted in November 2015 along northern boundary wall are doing well and promise to offer colour and interest throughout the summer. Watch out for the sweet smelling white flowers of the Philadelphus in early summer and the purple flowers of the lilac which are also highly scented. The plants will grow into a hedge along the whole 90 metre length in the next few years and will provide a natural habitat for animals and insects. Latchmere Recreation Ground The former tarmac area that was seeded to grass in October is flourishing and green. The area was reopened on the Thursday 24 March and consultation will follow to allow local people to help decide on further developments such as paths, seating and planting. Furzedown Recreation Ground The wildflower area that was installed in June 2015 is looking in good health after a slow start and should come to life and provide plenty of colour this spring and summer. There are already some flowers such as Self heal (Prunella vulgaris) and Ribwort plantain (Plantago lanceolata). Swaby Garden The junior playground will be refurbished and the toddler play area moved next to it. We will be seeking your votes on a large new playground structure for the centre of the playground, more information in the next newsletter. Leaders Gardens A new play garden will transform the shady grass area opposite the café. 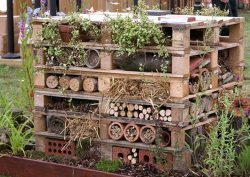 The new garden will focus on landscaping to form a natural area with an insect house, logs and planting. Upper Tooting Park In April we started to transform the toddler area into a larger play bus/climbing unit. Watch this space! We want to know your thoughts about the parks you use in Wandsworth. Staff will be touring selected sites to hear your feedback. The survey will also be available online through Survey Monkey and will be circulated through the newsletter. Subscribe to the newsletter here. Over the summer, staff will spend time at each community park talking to you, to find out your views about your local park. Look out for the green feather banner! The survey will also be online from 1 July to 30 September 2016. More details to follow nearer the time.